David Chang's Pork Buns: An Unexpected Hit New York chef David Chang talks about pork buns, the unexpected hit of his noodle shop, Motofuku. Chang, who has released a cookbook by the same name, discusses how easy it is to make the delectable pork buns. New York chef David Chang talks about pork buns, the unexpected hit of his noodle shop, Motofuku. Chang, who has released a cookbook by the same name, discusses how easy it is to make the delectable pork buns. Before we leave tonight, we're going to make another visit to the Momofuku Noodle Bar in New York City. If we were actually visiting Momofuku and its standing-room-only annex called Milk Bar, we'd find two eateries that are small and loud with not much in the way of decor, and there's always a long line of customers out the door. And when those patrons finally step up to bark out their noodle orders, most also ask for Momofuku's famous pork buns. David Chang is owner of Momofuku and author of the new cookbook with the same name. Chang says his pork bun works because of its complex mix of flavors and textures. 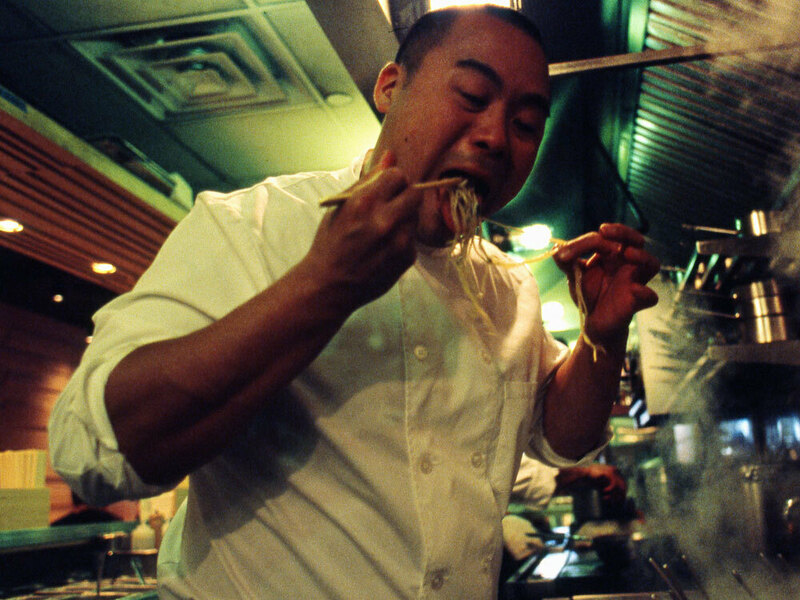 Mr. DAVID CHANG (Owner, Momofuku Noodle Bar): It's soft. It's unctuous. It has a burst of fat flavor from the salty pork belly, and then it's got this cool, crunchy texture from the pickled cucumbers and the sweetness in the hoisin sauce. So I didn't anticipate it ever being as wildly successful as it is, but they're sort of addictive. They just are salty sweet and sandwiched between a soft, pillowy, steamed bread. NORRIS: You say you're surprised by their success. Mr. CHANG: Yeah. People don't believe me when I say they were 11th-hour addition. I had in the book, it describes me on the hunt of the recipe of making steamed buns. People don't think that bread is part of Asian culture or Asian food culture, but it's quite prevalent in Northern China, and you see it throughout Japan and as you go to Taiwan. And I hadn't seen it in this form until I went to a restaurant called Oriental Garden, and that became an obsession. I would always ask the owner there and I call him Uncle Choi(ph) - I was, like, you have to give me this recipe. And I essentially went there every day bothering him and badgering him until he told me that he doesn't even make these things. NORRIS: You know, I'm wondering if maybe you should just read your description of the search for the bread because the description in the book is just so delicious, if you have the book. Mr. CHANG: This is sort of an esoteric reference to a movie, I think, that was produced by Quincy Jones. Mr. CHANG: (Reading) Have you ever seen the blacksploitation martial arts movie "The Last Dragon" from the '80s, where the dude is in constant search for some type of master who can provide some wisdom, and in the end, it turns out to be a hoax? The master's place is a fortune cookie factory. That's how I felt when the place I was sent to, learned the secret of steamed bread, turned out to be Mei Mei Foods, a local company that supplied dozens of New York restaurants with pre-made dim sum items, including the buns. Before it closed in 2007, the guy there, John, showed me the dead simple process: a little mixing, a little steaming and presto, buns. It turns out, they are made from a simple, white-bread dough. Mantou, the Chinese name, is not so different from, say, Wonder Bread that is steamed instead of baked. NORRIS: Like a bamboo steamer? Mr. CHANG: Yeah, a bamboo steamer would work. Line it with a little oil on the bottom so the bread doesn't stick and see what happens. NORRIS: Your book includes a recipe for the steamed buns. It's a huge recipe. It makes 50 buns. It seems like a lot. Mr. CHANG: Well, it's not it seems like a lot, but I guarantee you, if you make it for a party of six, theyre going to be all gone. NORRIS: Oh, so maybe 50 is not enough? Mr. CHANG: Well, it is I've seen people eat, like, eight. And if this was for a party, it would be a perfect canape, and especially if you make the bread, you can make them into a smaller size so they're literally one-bite things like a White Castle burger, almost. NORRIS: Mmm. So you take the bun, you slather on some hoisin sauce. NORRIS: You use some of the pickled cucumbers. Mr.�CHANG: No, no, no, you can make vegetable buns. We make shitake buns. The fillings are endless. But for me the biggest surprise why it became so popular was I didn't anticipate New Yorkers embracing pork belly as much as they did, because just a decade ago or even in the late 1990s, restaurants couldn't sell a dish called pork belly. So people would change it to be called fresh bacon, and I refuse to call it fresh bacon buns. I was, like, we're going to call it what is, pork belly, and to my surprise, people embraced it. NORRIS: David Chang. He's the chef and co-author of the cookbook "Momofuku." It's named after his New York noodle restaurant. In addition to Momofuku Noodle Bar, David Chang runs Momofuku Ssam Bar; an upscale restaurant, Ko; and a bakery, Momofuku Milk Bar. Was there a time when ramen noodles were all you ate? Tell us your ramen noodle stories. Ramen = broth + noodles + meat + toppings and garnishes. Chang first tried ramen the same way most people in America do — in small, cheap packets of dried, instant noodles. But, as he tells Michele Norris, his taste for the noodles blossomed when he lived in Japan and saw people lining up at ramen houses for homemade noodles tangled with ingredients like dried fish, pork and chicken. "Contemporary ramen is totally different than what most Americans think ramen should be. Ramen is not one thing; there are many, many different types," he says. Momofuku contains a recipe for his ramen broth that's miles away from the salty foil-wrapped flavor packets that come with instant noodles. In fact, Chang's broth recipe requires pounds of meat and takes hours to prepare. But, Chang says, the layers of flavor that result make the prep time pay off, especially if you think of the dish the way you would a hearty soup. "It seems like a lot of ingredients," Chang says. "[But] all you need is a big pot, and [you] just throw a bunch of ingredients in and let it simmer."